For large cup orders, please call us at 757-473-8951 for possible better shipping rates via long distance transportation carriers. Also feel free to call us with any questions about our tropical cups or professional advice what would be the best cup or cups for your next event or party. Also, if you would like to place your order by phone, please call 757-473-8951. Micro Yarder Drink Cups. These new Micro Yarders hold 12 oz of liquid drink and are packed 50 cups per case. Come in an assortment of 5 bright and attractive jewel colors. Great for kids and for those looking for a smaller size drink. Come with a coordinated coloring lid and straw. 16 oz. Mini Yarder Tropical Cups. Looking to offer a smaller yarder drink cup for the budget minded customer? Then this 16 oz. mini yarder is for you. Also comes in 5 vibrant fun colors. Lid and straw are included with each cup. Packed 50 cups per case. Transparent Tropical Hurricane Cups....our newest addition to our Tropical Line. Colorful, rich, and classy cup design will surely be a favorite for those looking for something fun and elegant. 15 oz. cup available in assorted colors. Packed 48 cups per case. New Colorful and Attractive Stackable Hurricane Cups. These new hurricane cups are designed with functionality in that they are easy to stack. Comes in 5 jewel colors. Packed 100 cups per case and are rated as a 16 oz cups. New for 2019.....Color Changing Hurricane Cups. Fun and unique souvenir drink cup that kids and adults will love. After they finish the drink, it will be a great souvenir to take home and use again. This classic hurricane cup can now change colors. Great for concession stands, trailers, festival fundraisers, or home or beach parties. These cups are great for frozen and tropical drinks...including slushees and smoothies. 15 oz cups that are packed 140 cups per case. The color change process is activated by putting a cold beverage in the hurricane glass. 15 oz. Tropical Hurricane Cups. These brilliant and colorful 15 oz.. Tropical Hurricane Drink Cups would be a great match and compliment for your fruit and tropical drink products. These bright colors are very eye catching and are a sure thing to increase your sales over the traditional parfait cups. Assorted colors. Packed 144 per case. Great for Mardi Gras and other festive events! 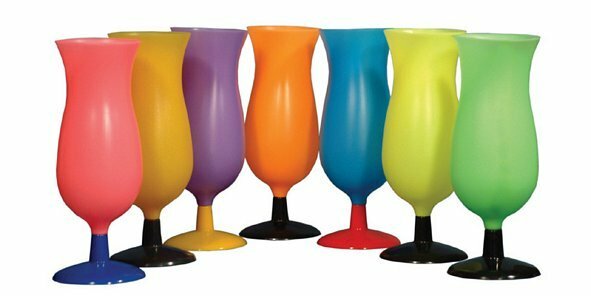 Assorted Color 16 oz Trumpet Yarder. If 28 oz is too big, then these 16 oz Trumpet Yarders are you for you. Each cup has a detachable base for easy stacking and storage. 3 assorted colors included. Packed 48 cups per case. 16 oz Clear Trumpet Yarder Drink Cup. This attractive looking yarder has a detachable base for easy stacking. In addition, this clear yarder comes with a lid and straw. Packed 48 cups per case. New Tropical Drink Cup Design....It's the Handle Yarder. This is unique and fun and practical variation to the traditional yarder cup. Each Cup has its own handle to help your customers grab and hold their yarder. Comes in 5 vibrant colors to add to your novelty drink ware. These cups hold 17 ounces of drink and are packed 40 cups per case. Ice Cube Emoji Top Tropical Drink Cups. Very Unique and Jazzy Designed Tropical Drink Cup. This cool new ice cube or ice frost design will be a hit at your next event. Just fill it with colorful frozen drink mixes and watch your sales soar along with the Summer temperatures. Great for festivals, ball parks, waterparks, and more. Choose your color of lid from a selection of 4 different colors. Holds 17 oz/500ml and case pack is 54 cups. Sold only by the pallet...call for more information....757-473-8951. There are 20 cases per pallet. 20 oz. Coconut Drink Cups in an assortment of colors. Unique and popular way to serve a variety of drinks. These coconut drink cups come with coordinating flower and straw. Packed 140 per case. Great for festivals and carnivals, beach venues, waterparks and swimming pools, tropical parties, and more! Great for Mardi Gras and luaus! Flexible Plastic Neon Drink Straws. Eye catching neon straws packed 600 straws per case. These straws are 7 3/4" Inches Long by 1/4 Inch in Diameter. Assorted color straws. New Twister Emoji Topper Drink Cup. This new fun Emoji Topper 12 oz Drink Cup will be a big hit this 2019 festival season. Packed 72 cups a case. Put a smile on your customer's face and your drink sales with this bright and cheery Emoji topping twister cup. Comes with lid and straw. We also now carry the new 32 oz Emoji Drink Cups. Kiddie Twister Bugged Face Topper Drink Cups. This kiddie yarder with funny face topper will be a hit with kids. The bug faced top kiddie yarders come with assorted pink and blue lids. 12 oz kiddie yarders are packed 72 cups per case. 12 oz Tropicool Drink Cups. Includes "Cool" print with glitter infused in the construction of the cup. Packed 96 cups per case that includes cup, and lids and straw. This cup is a dual chamber cup where there is division in the middle for two different types of drinks. Half Yarder Transparent Drink Cups. 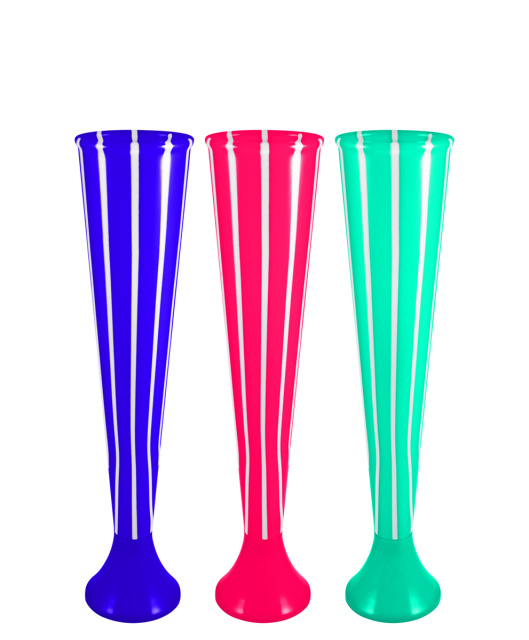 Eye catching vibrant colored half yard drink cups that will attract a crowd. This half yarder drink container is a trumpet-shaped bottle that can be filled with shaved ice, snow cone ice, smoothies, or ice-es. The textured finish makes them stand our and allows you to charge premium dollars for your drink. Each case is packed with an assortment of attractive and eye catching colors. Packed 37 24 oz. bottles per case. Uses 20" straws that can purchased below. Great frozen drink cup. 20" Straws for our Half Yarder Drink Cups pictured above. Neon straws are packed 500 per case. New for Unique 24 Oz Yard Cups. These cups are ordered by individual colors. Select from clear, red, blue, and green. These cups are without lid and straw. Packed 63 cups per case. If you would like printed cups, min order is 3 cases of 63 plus $100 plate fee. Call to order at 757-473-8951. New Bikini Yarder Drink Cups. Great cup for swimming pool and beach events, biker events, tropical parties, and more! These cups will be loved by all and the hit of the party.! These 17 oz Bikini Yarders come with lid and straw and are packed 48 cups per case. New Translucent Pineapple Sparkle Drink Cup. This eye catching 24 oz pineapple cup features a pineapple cup with handle and lid and straw. Great for pool parties, Hawaiian Luaus, and beach themed parties. The lid design features the pineapple green palm top with straw. Packed 72 cups/jars per case. Attractive and fun way to serve smoothies, tropical drinks, and more. 24 oz. Half Yard Tropical Drink Cups that come in 5 eye catching vibrant colors. Each cup comes complete with lid and straw. Each case is packed with 33 multicolor half yarder cups and each cup holds 24 oz. About 19" high. Works as a frozen drink cup or smoothie cup or use for your own creation. This product design generates great sales and great profits! The Longest Yarder Drink Cup. For those who want to super size your drink sales, then this 43 oz yarder is for you. This Clear XTRA Large Yarder comes with with a blue lid and clear straw. Packed 36 cups per case. 28 oz Martian Drink Bottles in green and purple. Packed 50 per case and are evenly divided between the purple and green colors. Great alternative cups to use for special shows and for halloween parties. Light up your Summer and Fall Nights with these Martian Drink Bottles. These space age bottles light up and will create a night time glow and will be enjoyed by all. Assorted green and purple. Packed 50 bottles per case: 25 green and 25 purple. Will be a hit from anywhere at the beach, to amusement parks, to Halloween activities. New .Alien Drink Bottle - Green. Look out the aliens are coming. Well, just the New Alien Drink Bottle. This Green Alien Drink Bottle holds 28 oz and features a larger opening than previous versions. Has a lid and straw. Can be used at various venues from Summer through the Fall. Packed 36 bottles per case. Now available green, blue, and purple. New for 2018....28 oz Patriotic Color Changing Drink Cups. Put some Patriotic flavor and flair in your drink sales with this 28 oz Color Changing Patriotic Theme Cup. Great for all the Patriotic Holidays and even election events. Will surely catch the eye of all your event goers and will drum up some extra drink sales. Packed 72 cups per case. New fun tropical yarder for....It's the Twister Yarder. Twist the night away with this uniquely designed attractive half yarder. Comes with lid and straw. Packed forty yarder cups per case. Comes in 5 hot tropical colors. New 24 oz Clear Lighted Lighthouse Yarder. Yes, this cool looking Lighthouse Yarder really lights up. Available in clear color. Grab a case or more today. This Light House Drink Cup will be the Souvenir Cup of the year with your customers. Something everyone will want to take home. Packed 35 cups per case. New 28 oz.Trumpet Drink Yarders. New twist on drink yarders with these cups featuring a detachable base and a striped design. Detachable base for easy stacking and storage. Cups come in 5 assorted colors. Packed 48 Yarders per case. New for 2019....Squiggle Yarder Drink Cup with Handle. Cool new looking Handle Squiggle Yards featuring a yarder with bubble design to make gripping the cup a breeze. And a top handle facilitates easy transportation. This yarder cup holds 32 oz and is packed 50 cups per case. Straw included. Lighted 28 oz Mason Jar Drink Cups. An old fashioned look that is still popular for serving drinks can now light the night with internal lighting cells in the bottom of the cups. Add some night time pizzazz to your lemonades, slushies, root beer, sodas and other fun summer drinks! Packed 72 jars per cases that include the handle, lid, and straw. New Guitar Yarder Drink Cup. You can have some fun with this good looking guitar yarder. Great for music fans everywhere. 24 oz size yarder with lid and straw is packed 36 cups per case. Each cup is over one foot tall at 16" in height. A great item for festivals and country western events and concerts. Be the first to display these new yarders! Something new and fun....The Bubble Yarder. Featuring tall cups with bubble indentations on the cup for a fun design. Old and young will alike will like this yarder. They almost look like balloon sculptures. Available in assorted colors. Cap and straw included. Packed 48 per case. 16 oz. Bubble Bottles. Packed in assorted jewel colors. Packed 48 per case. Make a statement in 2017 with these new bubble yarders! Fun design that will appeal to both young and old. They almost look like balloon sculptures. Straws and Lids are included. Another new vibrant tropical item at Standard Concession Supply...when the sun goes down, light up the night with these flash yarder tropical drink cups. Complete with straw and lid. Packed 36 cups per case and hold 24 ozs. Add some flash to your summer and fall night's sales. Will be a great night time attraction! 12 oz Clear Yard Cup with Green Palm Tree Lid and Straw. Popular Yarder with Palm Tree Lids are always a big hit and will increase your concession sales at festivals, pool parties, ocean and beach set ups, luaus, and more! Cups come with a safe lid and straw cap to protect your drink from spilling. 16 oz Palm Tree Cup with Lid and Straw. This 16 oz cup is eye-catching and flashy. This will be the hit at any party or festival event. And great hit at your next luau or beach party! Everyone will want one the drink that comes in this cup. Colorful palm flower is positioned in the top of the cup. Assorted 5 Vibrant Jewel Colors. 48 Cups per case. Another way to add some flash to your tropical drink sales is with these clear 16 oz palm tree cups. With brighter green leaves for 2019 this cups will stand out and will be hit and perfect for frozen specialty drinks. Packed 48 cups per cases. Ice Cube Emoji Top Tropical Drink Cups. Very Unique and Jazzy Designed Tropical Drink Cup. This cool new ice cube or ice frost design will be a hit at your next event. Just fill it with colorful frozen drink mixes and watch your sales soar along with the Summer temperatures. Great for festivals, ball parks, water parks, and more. Choose your color of lid from a selection of 4 different colors. Holds 20 oz. and case pack is 54 cups. Sold Only by the pallet....call for more information to order by the pallet. Bright and Flashy 24 oz. Tropical Palm Tree Drink Cups with straw and palm insert. These cups will grab the attention of all passersby. Comes in five assorted colors. Packed 48 cups per case. Put some splash into your tropical drinks and watch your sales grow. Perfect for frozen specialty drinks. Clear 24 oz (710 ml) Palm Tree Cups. We now offer 24 oz palm tree cups that are clear. And all palm tree cups now include brighter green leaves. Tropical Palm Tree Drink Cups include straw and palm insert. Packed 48 cups per case. Let the party begin! Tiki Cups that includes Bamboo Style Straws. Packed 80 cups per case. Comes in four Assorted colors. Perfect for frozen specialty drinks, tropical drinks and other novelty type drinks. Make a splash with your frozen concessions and fun Summer Drinks with these Tiki Cups. These are 20 oz. Tropical Cups. If you need lemonade supplies, then head over to our Lemonade Cups page.